PHOENIX — You can fish Arizona waters for free this Saturday, making this an ideal time to take the family out for some fun and relaxing outdoor recreation. 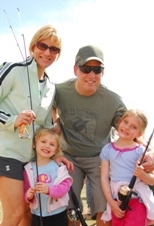 Arizona’s Free Fishing Day will be celebrated on June 3 this year as part of National Fishing and Boating Week, which runs June 3-11. This Saturday, no fishing licenses are required for persons fishing any public waters in Arizona. This comes at a time when the Arizona Game and Fish Department is stocking an extra quarter-million bass, trout and sunfish statewide through June. Remember that bag limits and other fishing regulations are in full effect and must be observed on Free Fishing Days. Kids under the age of 10 can fish for free all year long in Arizona, so this special fishing license exemption day means that the older kids and parents get a free pass for the day. Try fishing — you’ll like it! AZGFD will also sponsor some free fishing day clinics/events to give people the opportunity to try out this fun, family-oriented pastime. Loaner fishing rods, bait and instruction are provided for free at most of these venues. Lake Pleasant Regional Park, 7 a.m. – 10 a.m. There is a $6 vehicle park entrance fee. See more details. Dead Horse Ranch State Park lagoons, 675 Dead Horse Ranch Rd., Cottonwood, 8 a.m. – noon. Catfish will be stocked prior to this Verde Valley Fishing Fun Day. For more information, contact the park 928-634-5283. Yuma West Wetlands Park, City of Yuma Family Fish Fiesta, 7 a.m. – 10 a.m. Enjoy our state’s free fishing day! Get Google map directions to many of these waters on our Fish & Boat AZ map. Finally, see more fishing resources.